One of the hardest things, if you do something like readings, is to explain it. Who am I? I'm Kris Hughes and I am a native of SE Colorado, currently living in the Pacific Northwest. I spent 25 years of my adult life in Scotland, where I worked as a musician and music teacher, specialising in Scottish traditional music. I love cats and horses, I have a lifelong interest in the arts, in understanding nature and animals, and in the spiritual, mystical and metaphysical aspects of life. I see that many others are drawn to a similar mix, and (just as I did for a long time) they wonder what use it ultimately is. How can we weave the beautiful, the mystical and the natural into something that moves us forward? I believe that what I do in my readings offers us one approach. 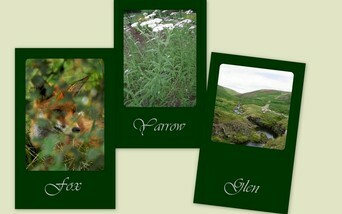 My oracle deck is based on nature and the countryside of Scotland and the British Isles. Plants, animals, aspects or the weather and rural landscape are all represented. During the time that I lived in Scotland, I was involved with these things on a daily basis. My cards are not based on other systems of divination, lore or interpretation. They are unique to me. The image on each card is connected to a web of associations, from personal experience, study of nature and rural life, and from my lifelong interest in folklore and mythology, then distilled to certain essential aspects. My readings are intended for your personal and spiritual growth, which will help you to arrive at answers to your questions. The material in the reading generally requires some quiet contemplation on your part, to receive its real benefit. As such, my readings are well suited to the bigger questions in life - "Why am I here?" "Is it time I made some fundamental changes?" "Why do I feel stuck?" and so on. They can also be helpful in clarifying your career path, understanding relationships and many other things, as long as you are interested in approaching this by better understanding yourself. How/why does this work? Although I draw the cards from the deck seemingly "at random" I believe that there is a higher energy at work, which causes each individual to get the cards they need. I also believe that a higher energy helps to guide me through delivering your reading. I do get flashes of intuition or empathy during readings, but I am not in a trance, or what some might call a clairvoyant. The vast majority of my clients are very happy with their reading. The tell me that their reading resonates deeply with them, and most tell me that it tends to make even more sense after they have spent some time contemplating it - perhaps over a period of weeks. However, if you get a reading from me, and feel it was a "dud" I want to know, and will try to make things right with you. If you would like more information before purchasing a reading, please use the contact button below. Readings on relationships between humans and their animal friends. Like many people my life has been filled by loving and living with animals, and I've been an avid student of training methods that draw on the behaviour of our pets' wild counterparts. It seemed a natural progression to offer readings for people who seek to deepen their understanding of their animal companions. Really, these readings are not different in approach than the ones I do on other topics, and I do no operate as an "animal communicator". However, these readings are a special area of interest and expertise that I offer.